Most of you who read Kittling: Books regularly know that I've had other things on my mind the past several weeks, and it's been difficult to maintain the status quo, or even improve upon it. I'm happy to say that it may be a lot easier for me to focus now, and I'll tell you more in another post. Right now, I have some links I'd like to share! Three links for bookaholics who like to combine storage and furniture: a sofa, a chair, and entire way to build a house. How well do you think you'd do with a Brooklyn Books quiz? Oh oh. There's now a game called The Great Gatsby for NES systems. 25 Films That Bibliophiles Still Love. A fascinating article on the language of an Amazon tribe called the Piraha. The 50 most essential works of Jewish fiction of the last 100 years. An article in Newsweek about The Future of the Book. Got an old vase that you've been thinking of throwing out? Read article one and article two before you do! Bloggers credited with boosting 2010 sales of The Book Depository. Jamie of The Perpetual Page-Turner wants to know our opinion of Author Interaction on Reviews. Does the sidebar of your blog help visitors? How to make all links open in new windows if you have a Blogger blog. Hopefully you found some goodies in amongst all these links. 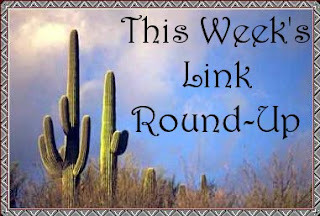 Don't forget to stop by next weekend when I'll have a fresh batch of hand-picked links for your surfing pleasure! Thank you for the links to the two new blogs. I enjoyed the article on literature for students in one of the blogs. Cathy - I always love these roundups :-). There's nearly always something I haven't gotten to that you show me I've missed, or that you remind me of :-). Thanks for the link to the New Yorker article on language of the Piraha tribe. I had a note to look it up; now you've saved me the trouble. Mystica-- Glad you enjoyed the links! Barbara-- Great! It's a fascinating article. Lots of goodies this week! I was happy to note that of the 25 files that book lovers like..I agree with the ones that I've read and watched. One book I would have liked to see listed though is Fried Green Tomatoes and the Whistle stop Cafe. Kris-- That is a good choice!